Vis-a-vis the media examination and outrage leveled at them, Oak Park backed off threatening a woman with 93 days in jail for having a vegetable garden rather than a suburban lawn. They have a picture of the garden, so you can go judge for yourself. I think it looks fine. However, that’s the norm. I have pressure from my neighbors to keep the grass mowed and looking good and it enhances the value of my property (and my neighbors’ property). So, it has the reciprocity of advantage that zoning generally does- I’m limited in what I can do with my property, but my neighbor is too. I don’t care whether the woman is a liberal or not, but I bet if her neighbor, for example, filled their lawn with orange and maroon Hokie birds*, she would complain very loudly. Same thing. It’s a slippery slope. If she’s allowed to do whatever she wants with her front yard, then so is everyone else. Jesse nicely explains the rationale for zoning here: It’s a form of mutually assured property value stabilization agreements. I should have realized that I am more of property rights hawk than Jesse is. I think that governments that don’t take property rights seriously (or any other rights) are dangerous, period. There are other issues here. In the Oak Park case, they just made themselves look like jerks in front of the country–yet another example of bureaucrats gone wild in an ongoing Tea Party discourse about the evils of government. Even if you think she should have a lawn, I’m just not willing to use public money, in a fiscal crisis zone like Michigan, to stick somebody in jail for it. There are just plain bigger fish to fry. That’s just an obvious abuse of government’s power to incarcerate: do something else, like cut off her services or increase her fines. The most well-articulated challenge to the rights-view I have ever read comes from Mary Ann Glendon in her book RightsTalk:The Impoverishment of Political Discourse. In it, she lays out the communitarian objection: community norms matter. She argues against homosexuality, for example, because it flies against community norms. It bothers the rest of us, so it’s not legitimate. The zone of public ethics is a tension between these communitarian and individual questions: how much should my behavior defer to the wants of community or family or whatever group, and how much should they accommodate me and my preferences as an individual? It’s a simplistic formulation: most of us are inseparable from our groups, but in modern life humans are too numerous and mobile for shunning to work as a means of punishing a person back into the community’s norms. If Oak Park residents stopped speaking to her, she could always chat with her Facebook friends and order groceries from Amazon. To take an extreme, a recent New Yorker cartoon had a woman glaring at a man sitting at a nearby restaurant table, where he was clearly enjoying the bread basket, as she confronted him with “Do you mind?” with the caption “Secondhand carbs.” To me, it epitomizes the “he’s looking at me funny” entitlement that underscores a great deal of aesthetic regulation. It’s tempting in American life, which has pitched home ownership into a sacred thing, to treat something that might affect your property value as Real Harm. I’m not willing to do that. For one thing, it does cause people real harm on the other side as well: if you really do have a preference to fill your lawn with Hokie birds (which while ugly, is also temporary and fixable), than why should the person who doesn’t want them win the day just because they got the regulations in place prior to the first person’s preference? If it’s a nuisance, why can’t Coase sort it out rather than regulation? You don’t want her to garden, you negotiate a price for her to not garden—rather than assessing a fine FOR gardening. This strikes me as a much more dynamic embodiment of communitarian principles than regulation. For example, there is a house in Larchmont that has 24 white plaster Adonis statues in front. Larchmont is millionaireland in Los Angeles, one of many, and the neighbors went crazy and passed a bunch of rules to make sure that nothing like that will ever happen to besmirch their streetscape ever again. Meanwhile, he’s grandfathered, so he wins the day. That’s not communitarian. Communitarian rules would involve the negotiating of a consensus around objections and preferences–not whoever won the “most homogenized regulatory preference” race. Real harm versus nuisance is a muddy area. But, there are houses in Berkeley, California, with vegetables in their front yard, that sell for 8 times what the manicured lawn places in Oak Park sell for. In fact, Berkeley’s diversity of built and plant forms (along with the gazillion things California has done to make land scarce and Berkeley impossible to reproduce) contributes to the land value. Maybe the context and community norms matter, but it is just as likely that enforced homogeneity of codes depresses values as well as stabilizes them (in fact, that’s what the theory would suggest). Gosh, I never thought I would be called less of a property hawk than anyone. I’ve been called more of a property hawk than Justice Scalia. See my article, “Downzoning, Fairness and Farmland Protection”, 19 Journal and Land Use and Environmental Law 59 (2003). I’m also not very keen on regulations to promote aesthetics. You hit on the real issue, as I see it, when you talk about nuisance. (are pink flamingos in the front yard a nuisance?) It’s a line-drawing exercise and determining the line beyond which you have a nuisance is very difficult. “There is perhaps no more impenetrable jungle in the entire law than that which surrounds the word nuisance.” William Prosser, The Law of Torts, 4th ed., page 571. There’s a great U.S. Supreme Court case that boils down to cedar trees v. apple trees (out of Shenandoah County, 276 U.S. 272 (1928). The apple trees won (because of economics, I think), but it’s a great illustration of how sometimes it’s difficult to say who is infringing on someone else’s property rights. Stated differently, “Your rights end at the tip of your fist. My rights begin at the tip of my nose.” Whose property rights are at issue here? The woman with the veggie garden yard or her neighbors? Of course, the economist and libertarian parts of me want a Coasian solution, but we could just as easily argue that she can follow the Tiebout analysis and find a city where everyone likes to have front yards that are entirely vegetable gardens. Obviously, that’s not the case where she is now. 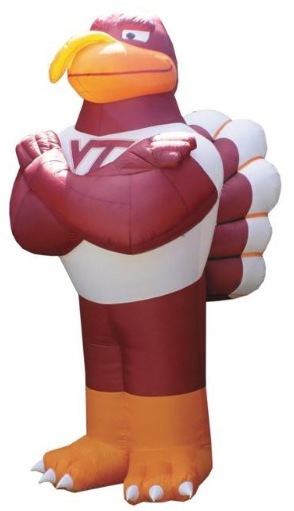 I have to go now, I have about 150 Orange and Maroon Hokie Birds to put in my front yard. It’s my constitutional right. At least the Hokie birds would keep the lawn short. A better analogy would be the folks in Northern Virginia who were paving their front yards for parking. Local governments jumped in very quickly to prohibit that. There was no public outrage or media attention then. I wonder why.